Not since the early days of web standards have I seen our community rally around a seemingly small issue: responsive images. Over the last four years (yeah, it’s been about four years), we’ve seen many permutations of images in responsive design. The RICG began working on the picture element, sharing its work with the W3C along the way. The solutions got pretty complex. Talk of the picture element started, and a group called the Responsive Images Community Group (RICG) appeared. The RICG began working on the picture element, sharing its work with the W3C along the way. The result has led us to today and this discussion about all of the progress that’s been made. Because most of the responsive-image community was on board with the picture element and looking forward to it because of the great polyfills, such as Picturefill, it went ahead and released a well thought-out and fleshed-out document outlining something called srcset, which is an extension of the standard img tag. Yeah, I know — it feels like it came out of nowhere. It was also super-complicated and overly limiting by restricting you to (implied) pixel values and using a microsyntax that didn’t allow for scalability with media queries in the future. Luckily, the syntax has matured into what we have today, which is a fairly robust recommendation. Three major attributes are in the snippet above: alt, src and srcset. The alt attribute is the same as it’s always been; src is the fallback if srcset isn’t supported; and srcset is obviously the meat and potatoes here. We can see three arguments in srcset. The first is the image path. The second gives the browser information about the natural widths of the sources, so that it knows which resource to serve to the user (based on the user’s preferences and cross-referencing with the sizes attribute – I told you it was complicated). The last piece sets the optional pixel ratio (2x in this example specifies the high-definition image). One thing I really love about srcset is that the specification states that the browser should contain image-allocation preferences for certain bandwidth situations. This means you don’t have to worry about serving a 2x image to a high-definition screen if that device is on a cruddy 3G connection. The user’s preferences should take over, and the browser would choose the appropriate image to serve. After much complaining about our new weird friend, srcset, the RICG continued working on the picture element, which is finally getting some serious traction with browser makers… well, that is, with Chrome. The proposed syntax for the picture element might look familiar because we saw it largely in the first version of Picturefill, and it’s not unlike how <audio> and <video> are marked up. As you can see, a source tag is in the picture element, along with a normal img tag. Just as we saw with src in srcset, the img is a fallback. In the source tag, we have what looks like a media query, alongside a srcset attribute that contains the same image-source and pixel-density arguments as before. This seems like a nice clean way to popularize responsive images; we’re generally familiar with the syntax, so it should be easily adopted. The srcset attribute has been supported in Chrome since version 34. At the time of writing, it is not supported anywhere else. Mozilla appears to be working on an implementation (fingers crossed). Internet Explorer is nowhere in sight. The picture element has even worse support; it isn’t even in Chrome yet. But like Mozilla with srcset, Google is currently working on implementing it. If you can stomach reading through a specification, I highly recommend it. Even though there isn’t much of a plot and the character development is pretty weak, it’s still a pretty good read. Picturefill 2.0 was created because native support is reasonably close. You know we’ll need a rock-solid polyfill to use when the time officially comes, so let’s take a look at it! Picturefill 2.0 was recently released as beta, and it’s quite a large jump from version 1. The RICG really aimed to create a one-stop solution for responsive images. The challenge was to create a script that allows you, the developer, to use any combination of the solutions currently being standardized, without bloating it to the point that not using it at all would be more lightweight. If you’re currently using version 1.0, I highly recommend upgrading to 2.0. It’s a big step towards a better solution to serving the correct image to the user. Some big changes have been made to the syntax and functionality. Let’s look at what’s new. One thing that makes this polyfill different from others that I’ve seen is that it polyfills a concept, not just an unsupported block of HTML. Picturefill 1.0 used spans and custom attributes to mimic how we thought responsive images should work. For the record, it is a great solution, and I currently use it for many of my projects that haven’t been converted to 2.0. In the last year or so, the specification for srcset and picture have matured so much, so we can now actually get to use something close to the real syntax. Picturefill is starting to look like a true polyfill, one we can strip away when real support shows up. If you’ve read this far, then you’ve probably dealt with some form of polyfill in the past. This one isn’t much different. Polyfills are supposed to be set-it-and-forget-it (to steal a line from Ronco), but because this is an HTML polyfill, you’ll need either to create the picture element manually or use some form of HTML shiv to do it for you. Luckily, HTML shivs are pretty common and ship with toolkits such as Modernizr; just verify that picture is supported in whatever shiv you choose. Other than creating the picture element, you simply have to link to the script. Using the async attribute is also recommended, so that Picturefill doesn’t block your page from loading. Let’s look at the syntax that provides the best support and that uses srcset. It should look familiar because it has the same attributes that we saw when discussing the specification. <img sizes="100vw, (min-width: 40em) 80vw"
The most glaring difference between this snippet and the specification is the absence of a fallback src attribute, which was intentionally removed to prevent images from being downloaded twice in unsupported browsers. And, really, what would be the point of this if images were downloaded twice? Other than that, it’s pretty faithful to the specification, but it will probably evolve over time as the specification fleshes out and the polyfill matures. The biggest change between versions 1.0 and 2.0 is the removal of some traditional HTML (divs and spans) and the addition of newer elements (picture and source). Also, srcset support is built in (heck, why not, right? It’s in the spec!). This is great step forward for this polyfill. Use as many or as few of these options as you’d like. In line with the specification, if you don’t want to use the 2x option, you don’t have to (and so on). The difference between this and the official picture element is the img fallback. You’ll notice here that the img fallback also has a srcset attribute, instead of a normal src (which is widely supported). Again, this is to prevent double-downloading (it’s a real problem). The srcset in the img tag would also cause double-downloading if the browser supports srcset but not picture. This bug should get worked out in the beta version. 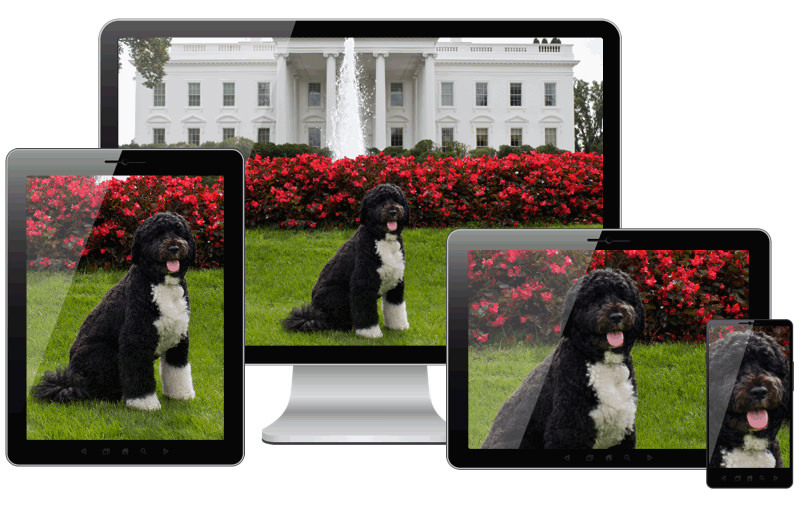 We’ve come a long way with responsive images. We can see the light at the end of the tunnel, but a lot of work still has to be done. And we’d love your help! If you’d like to get involved and help out with the responsive-images movement, join the RICG via the W3C. If that’s too much, we’re always looking for people to try out Picturefill’s beta version and submit bugs through the issue tracker on GitHub. You can also spread the word about great tools like Sizer Soze, which calculates the performance cost of not using responsive images.